Skolnik Closed and Open Head Steel Drums Securely Contain Hazardous and Non-Hazardous Materials for Storage and Transport. Skolnik Closed and Open Head Steel Drums feature a corrosion resistant interior for corrosive material handling. Durable Drums comply with Title 49, Code of Federal Regulations and are UN approved. Open Head Drums feature a removable top, EPDM "D" gasket and a 12 gauge bolt ring. Closed Head Drums have 2" and 3/4" bung openings, one for filling and one for venting. Drums with a Chemical-resistant Epoxy Phenolic Lining are also available. 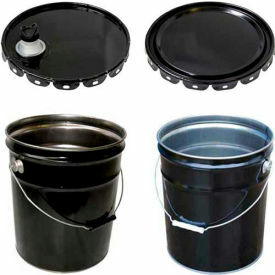 Steel Pails help to easily Transport Liquids. 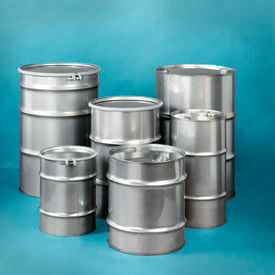 Rugged and reinforced Vestil Steel Pails & Lids are suitable for the safe, reliable transport of bulk liquids. 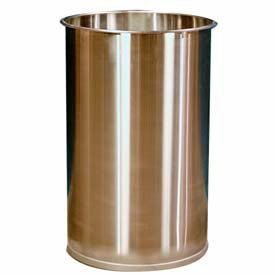 Pails feature rust inhibiting lining for corrosion resistance. 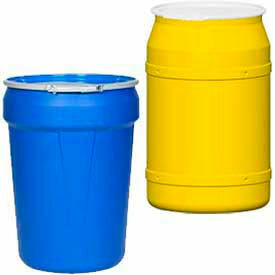 Plastic Pails and Lids are used for applications including Maintenance, Distribution, Storage, and more. 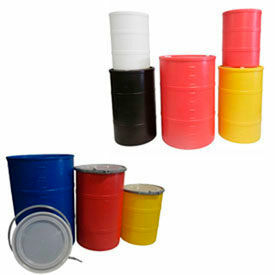 Plastic Pails and Lids are made of polyethylene or polypropylene for long lasting durability and corrosion resistance. 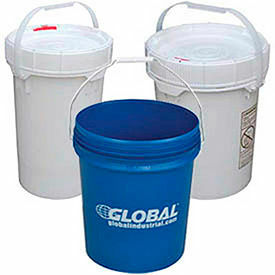 Pails provide convenient storage and transport of fluids, chemicals, tools, and more. Lids ensure spill prevention for content stability and maintenance ease. Carry handle allows ergonomic unit handling and mobility. Nesting feature maximizes vertical storage while reducing unit footprint. Accommodates liquids up to 190°F and freezer applications. Pail types are Open Head and Screw-Top/Lid Combo. Gallon capacities are 1, 2, 3-1/2, 5, 6, and 6-1/2. Lab Pack Drums store smaller non-damaged Bottles, Cans, Carboys, Drums and Pails containing non-leaking Hazardous Materials. Lab Pack Drums are made of durable blow molded, high density polyethylene that is chemical and weather resistant for long lasting use and dependability. Lab Pack Containers feature an operating temperature range of -30°F to 130°F. Includes lever-lock for secure lid attachment. Approved for use with Packing Groups I, II and III. Plastic Lab Pack Containers are UN certified to HM-181 and pass the UL 94HB Flammability rating. FDA 21 CFR 177.1520 food grade quality. SPCC compliant. DOT 49 CFR 173.12 compliant. Available capacities are 14, 30, and 55 gallons. Colors are Black, Blue and Yellow. Dimensions vary per model. Skolnik Closed & Open Head Stainless Steel Drums outperform conventional Steel Drums in Corrosion Resistance and Reusability. Skolnik Stainless Steel Drums are perfect when purity and compatibility of materials is important. Drum is constructed of Type 304-2B polished stainless steel that is designed specifically for use with food products, pharmaceuticals, chemicals, water storage and other corrosive product applications. UN rated. Open Head Stainless Steel Drum features a 16 gauge removable top, and an 18 gauge body and base. Drum has an EPDM "D" cover gasket and a 12 gauge carbon steel bolt ring with a 5/8" bolt. Closed Head Stainless Steel Drum has an 18 gauge top, body and base. Drum features a 2" x ¾" stainless steel tri-sure fitting in the head. Open Head Stainless Steel Seamless Process Drum is non-UN certified and constructed of a 1.5mm (16 gauge) type 304 stainless steel body, base and removable cover. Drum features a ½" white EPDM cover gasket, 12 gauge 304 stainless steel 5/8" x 4" nut/bolt and a 304 stainless steel bottom foot ring. Closed Head Stainless Steel Seamless Drum is UN 1A1/X2.0/600 certified and constructed of a 1.5mm (16 gauge) type 304-L stainless steel body, top and base. Drum features 2" x ¾" drop-forged 304 stainless steel "weld in" flanges, 2" x ¾" drop-forged stainless steel TS plugs with Viton® gaskets encapsulated in PTFE, top and bottom 304 stainless steel foot rings and two 304 stainless steel roll bars. 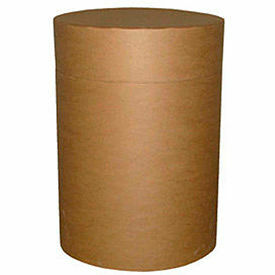 Vestil Lightweight Fiber Drums are a Cost Effective Alternative to Steel Drums. Vestil Fiber Drums are designed to be used with Dry or Solid Materials. All-Fiber Drums do not have any steel components. These Open Head Drums feature a flat top and bottom for easier stacking, saving valuable storage space. Vestil Galvanized & Stainless Steel Buckets are designed for Industrial & Commercial applications when Durability is Required. Vestil Galvanized & Stainless Steel Buckets come standard with a carrying handle / bail for easy transport and nest to save space when not in use. Galvanized Buckets are constructed of 0.4mm thick galvanized steel for strength and rigidity, and feature a spout for controlled pouring. Stainless Steel Buckets are constructed of grade 202 stainless steel for maximum corrosion resistance. 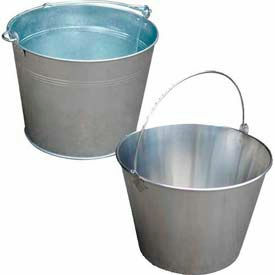 3-¼" gallon bucket is 1mm thick and 5 gallon bucket is 2mm thick. Skolnik Steel Salvage Transport Drums Overpack Leaking Drums and Sorbents for DOT Compliant shipments. Skolnik Steel Salvage Transport Overpack Drums are used for shipping leaky, damaged or non-compliant steel or poly Drums, and as a safeguard against drums that can rupture during transport. 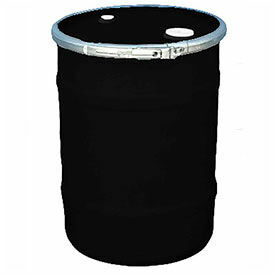 Salvage Drums can also be used to overpack Containers, for containment/transport of soiled sorbents and hazardous solids, or in spill kits for the clean-up of contaminated sites. Constructed of high quality carbon steel, Drums meet the UN design type requirements. Salvage Drum features a yellow body with a multilingual salvage Drum logo, and Drum cover includes a bolt securement ring and an EPDM gasket. Stainless Steel Open Head Process Drums are used for Pharmaceutical and Food Industry Applications. Stainless Steel Open Head Process Drums are made of rustproof T-304 Stainless Steel for long lasting durability and strength. Drum bottom provides heavy duty wear ring. Drum top offers easy to grip sanitary open rolled rim. The Morse® PailPro™ 5 Gallon Pail Dolly features a flat deck with four rounded corners turned up to hold the pail in position. Easily moves pails on 3" polyolefin swivel casters. Durable steel frame with blue enamel finish. 200 lb. capacity. 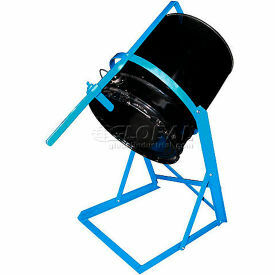 The Vestil Manual Pail Dispenser is designed for rotating and dispensing contents of 5 gallon plastic and steel pails. Variable height chime lock for quick loading. 10" dispensing height. Durable steel frame with blue enamel finish. 70 lb. capacity. Easy assembly. US Roto Molding Closed and Open Head Plastic Drums are used for applications including Commercial, Waste Management, Distribution, and more. US Roto Molding Closed and Open Head Plastic Drums are made of polyethylene for long lasting durability and corrosion resistance. Drums are designed for ergonomic handling, storage, and transport of chemicals, food, cosmetics, pharmaceuticals, waste, and more. Units are stackable, reusable, and recyclable for storage, cost effectiveness, and reduced carbon footprint. Roughened chimes allow convenient personnel and equipment handling. Ample top and side space allows content labeling for inventory control. Includes chime drain vent for water collection prevention. Features NPT plugs. Gallon capacities range from 15 to 55. Head styles are Closed Head - Bung Cover, Open Head - Bung Cover, and Open Head - Plain Lid. Closure styles are Bolt Ring and Lever Lock. Colors are Black and Green. FDA approved. Dimensions vary per model. DPI™ Closed & Open Head Plastic Drums are used for Applications including Storage, Distribution, Waste Management, and more. 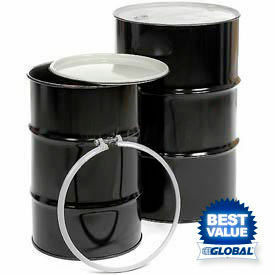 DPI™ Closed & Open Head Plastic Drums are made of polyethylene for long lasting durability and corrosion resistance. 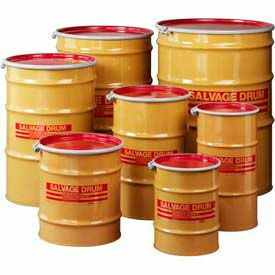 Drums provide ergonomic storage, transport, and disposal of both liquid and solid materials. Includes threaded top openings or removable lid with metal lever locking ring for content stability and spill prevention. Features molded 5 gallon increments for content level measurement. Package quantity is 1. Color finishes are Black, Blue, Green, Natural, Red, and Yellow. Dimensions vary per model.